Bathed in the golden light of the sun disappearing behind the horizon, everything looks dazzling. But where do you find those extra special, pristine spots to enjoy a sunset in all its glory? We live in a country that offers so many of these natural treasures, it seems almost impossible to choose! Now summer is here in full force, which means there are plenty of days ahead to chase remarkable sunsets. 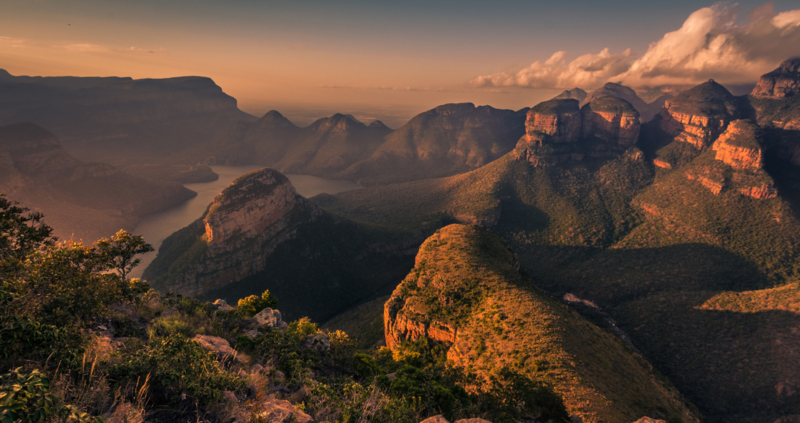 That’s why TravelGround took the initiative of pointing out seven scenic places in South Africa where you can bask in the magic of the golden hour with your favourite people, without the man-made clutter on the horizon! This little Eastern Cape gem is girded by the Amathole Mountains and the indigenous Afromontane forest. It’s over a kilometre above sea level, so just imagine the views you’ll be greeted with in and around this town! You can easily pack your favourite snacks and drinks, jump in your car, pick a direction and drive a few minutes out of Hogsback. You’re bound to be in awe of the surrounding spectacular mountain ranges and forested areas, with the rays of the setting sun laying orange kisses on their rugged cheeks. It is said that The Edge Mountain Retreat, with all the cliffs surrounding the retreat, is the place to go to be enchanted by a glorious sunset! Between Durban and Pietermaritzburg, in the midlands of KwaZulu-Natal, lies this enthralling display of hills that seems to go on and on ─ hence the name, The Valley of a Thousand Hills. Needless to say, this valley is best explored by car, so you can stop along the road and choose where to enjoy your magical moment. Feast your eyes on both the Drakensberg Mountains and Indian Ocean while exploring this area ─ two birds with one stone, I’d say! Although the idea of a picnic on the beach with a sunset in the background can seem cliché and hackneyed by now, we can’t deny that there are few things quite as soothing as a golden hour on the beach. Yzerfontein is a little coastal town on the West Coast that considers conservancy as a top priority, rendering this charming town its pristine feel. Worn-out Capetonians would only have to drive an hour along the R27 for a dreamy, candy floss sunset on this Sixteen Mile Beach! When on holiday in and around Sabie in Mpumalanga, you should be ashamed of yourself if you don’t take a drive along the 26.2-kilometre Long Tom Pass! Curving between Lydenburg and Sabie, this mountain pass forms part of the marvellous Panorama Route. It is almost impossible not to find an ideal sunset spot between this captivating network of hills. Whether you’re going on a romantic drive, or taking the kids for a spin, Long Tom Pass’ majestic cloak of greenery would impress anyone. The Northern Cape is known for its barren, and in some areas, forgotten landscapes. But this arid area boasts fiery sunsets that light up the whole sky! Nothing beats a sunset with the contrast of the rocky plains etched against the blue sky. Although the Augrabies Falls roars most impressively between April and September, don’t hesitate to visit this area throughout the year ─ the sunsets out here always paint the sky in red and orange, regardless of the season! Just be aware that the Augrabies Falls area gets extremely hot during summer, so come prepared. Those of you who have been lucky enough to experience the tangerine skies of the Madikwe Game Reserve when the sun dips behind the horizon, know that the wilderness in the North West is arguably the best place to enjoy the golden hour. Your surroundings would seem like something from a perfectly painted canvas and the tranquility that comes with this time of day, is priceless. A better way to enjoy a sundowner with your favourite people is few and far between! The Eastern Highlands in the Free State link South Africa and the mountain kingdom of Lesotho. If you’re travelling from Gauteng to Cape Town this summer, or vice versa, be sure to take some time to appreciate this picturesque area. It’s recommended that you drive along the scenic Route 26 and Route 49 east of Bethlehem, en route to the Golden Gate Highlands National Park, where the towering monoliths above the golden fields will be lit up spectacularly. Try to avoid taking pictures facing the sun directly. Ensure that the sun is behind or next to you for optimum lighting ─ don’t let your shadow ruin the picture though! If you want to take a picture manually, remember that there’ll be less light on your subject and the sky might appear white. Don’t turn yourself or your subject in the direction in which the sun is setting, this will ensure a more balanced image. Bring your tripod for steadiness if you have one, because the sun sets faster than you think and might cause the picture to be blurry. The more light is let in, the better. When in doubt, let your device do the thinking ─ use the auto setting! You don’t have to make big plans to have big fun. Pack your snacks, sundowners and camera this summer, and go where the golden hour is most magnificently crafted by nature!